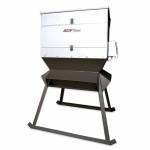 Want to feed on-demand corn or protein, but do not want to sacrifice one of your feeders to do so? 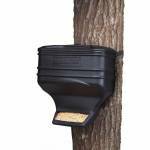 Now, you can use the T-Post Gravity Feeder and feed anywhere you can strap to a tree or drive a T-post into the ground. 80lb Capacity UV Resistant Polyethylene 2 Mounting Options - T-Post or Tree Straps Secure Lock Twist On Lid Covered Downspout to Protect from Rain and Weather Adjustable Feed Flow ..
All Seasons 600lb Stand & Fill Electric Protein Deer Feeder. Stand & Fill this feeder from the ground without use of a ladder. Perforated feed ttray to keep feed fresh and dry. Head holds up to 75lbs of protein. 12v Battery / Solar ASF Timer with motor speed control Skids for easy relocation Can feed up to 6 times a day Dispenses 12lbs of feed in 10 seconds Note: Sold in Store Only. These units can not be shipped. 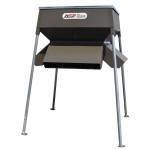 ..
All Seasons 1000lb Stand & Fill Electric Protein Deer Feeder. Fill this feeder from the ground without use of a ladder. 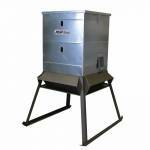 Regulate your protein delivery just like you would with a standard corn feeder. Constructed of galvanized steel to provide added durability against the abuse of large animals and hogs. Approximately 6' tall. 12v Solar Panel ASF Timer 12v Battery Included Perforated feed tray to keep feed fresh and dry Can feed up to 6 times a day Dispenses 12lbs of feed in 10 s..
AThe Stand & Fill™ protein feeders maintain the quality and durability of ASF evolution protein feeders, while offering customers a much safer way to fill their feeder, from the ground, without ladders! • Elongated sight glass • Protein Evo head design • Made with 16 gauge steel • Varmint and weather resistant • Adjustable baffles to regulate feed flow • Low profile for easy filling • Feed Ports stand approximately 35 inches tall Note: These units require Freight S.. 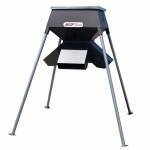 This protein feeder is great for a small operation or introducing protein into your feeding program. 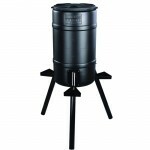 The 300lb capacity hopper is our patented design which allows protein to funnel into the galvanized 4 way protein head. The protein head is built to be varmint and weather resistant. With adjustable baffles, this feeder allows you to regulate the flow of feed into the head. Baffles in Protein head allow for feed flow regulation Galvanized contraction to prevent corrosion Comes with (4).. 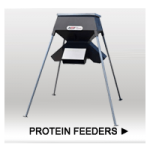 This protein feeder is great for a small operation or introducing protein into your feeding program. The 800lb capacity hopper is our patented design which allows protein to funnel into the galvanized 4 way protein head. The protein head is built to be varmint and weather resistant. With adjustable baffles, this feeder allows you to regulate the flow of feed into the head. Baffles in Protein head allow for feed flow regulation 2 Sight Glasses to view feed levels Galvanized 4-way head .. The Stand & Fill protein feeders maintain the quality and durability of ASF evolution protein feeders, while offering customers a much safer way to fill their feeder, from the ground, without ladders! Feeder includes: Elongated sight glass Protein Evo head design Made with 16 gauge steel Varmint and weather resistant Adjustable baffles to regulate feed flow low profile construction for easy filling Sold In Store Only ..
Boss Buck feeders encourage deer to visit your favorite hunting spot! Thanks to its rugged rotomolded plastic construction and convertible 2-in-1 leg system, this protein gravity deer feeder is easily converted to an 12V automatic deer feeder system. Made in USA. 200lb corn capacity or 150lb protein 3 Head Protein Tube Includes multi-piece legs Feed tubes have 10° Angle Feed tubes have 1" overlap on top of each Port Feed tubes are 8" long and 4" I.D. Each Port has a drain hole ..
Boss Buck 600lb Gravity Protein Deer Feeder. The 600lb. capacity hopper has a thick wall of Roto-Molded HDPE UV Protected plastic that will not rot, rust or leak! 84" With the Patented Protein/Gravity Head you get the most moisture resistant free choice deer feeding system available on the market today! The Custom Designed gravity head features a 10 degree angle, and a 1" overhang on the 4" feed ports. 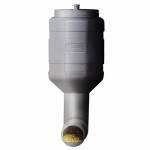 Each feed port is 8" long and has a drain hole to disperse any water that might enter the tip ..
With no electronics or moving parts to fail, this basic gravity model offers unbeatable value and unmatched ease of use. Simply strap it to a tree—no batteries, programming or assembly necessary. Moultrie’s Feed Station deer feeder also offers surprising versatility, dispensing a variety of feed types, from powders to corn to mixtures. 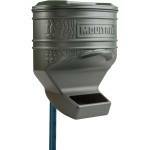 Gravity-driven trough design Durable, UV-resistant plastic construction 40 lb. capacity Strap for tree or post mounting included .. The Feed Station Pro holds 80lbs of feed and is a gravity fed free choice feeder that simply straps to a tree. No timers, no batteries, no mess. UV resistant plastic keeps your wildlife fed. Supports a variety of feed types including corn, protein pellets or powder as well as supplement powders. Weeping holes in the bottom of the feeder wicks water from the feed. Also mounts to a t-post with 2 included mounting straps. Gravity-driven through design 80lb capacity Durable, UV-resistan.. On-Time Buckeye 30 Gallon Gravity Deer Feeder. 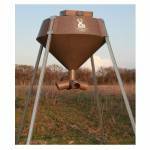 An innovative approach to deer feeders, the Buckeye is designed to let gravity fill the feed tray ensuring that fresh feed is always in stock. Each of the three 2" diameter legs holds a separate feeding station with drain holes for consistent flow. With no moving parts to break down or a battery to run out of power the Buckeye can be used year-round without worry! Its 200-lb. hopper features an internal feeder funnel and a removable lid for convenie..